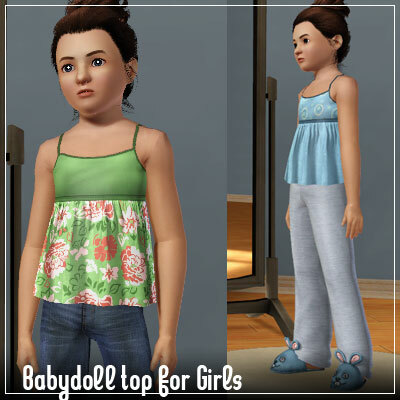 A cute new ‘babydoll’ / swing top for girls. It blouses out above the waist, and extends down lower than the average top, sitting nicely over everything from skirts to jeans to pajamas. It is categorized for all categories (everyday, formalwear, sleepwear, athletic and swimwear) as it is a pretty flexible style. There are three recolorable/pattern-able areas: the trim/straps, the chest, and the ‘skirt’.